The golden-breasted eagle’s home was at such heights that she had to dive several hundred metres to get to work. From her abode on the cliff, all she could see was a carpet of smoky, white clouds that occasionally gave way to a glimpse of lush green below. The eagle was a single mother, with two little eaglets, each three months old. They weren’t twins in the conventional sense, but did resemble each other. The eagle would need to go daily down to the ‘market’, bustling with ready-to-eat hares, rodents, small low-flying birds and baby goats (or kids). The mountain goats that seemingly defied gravity would graze at heights that even the eagle admired. Their little ones when a few months old, were a perfect meal for the eagle and her family, though carrying one of those kids in her mouth would give the eagle a jaw-ache for two days. The hares or the bandicoots were easier on the mouth, but less sumptuous and enduring. The eagle wasn’t always particular about her preferred cuisine, so long as she brought back an adequate treat for herself and her babies at home. Her fabulous home was the envy of Man, where the air was thinner, colder and cleaner than any other place with life. The weather was sublime – freezing cold at night, but, equally, warmed by the choicest rays of the sun by day. The pace of life was relaxed and hunting for food the prime occupation. 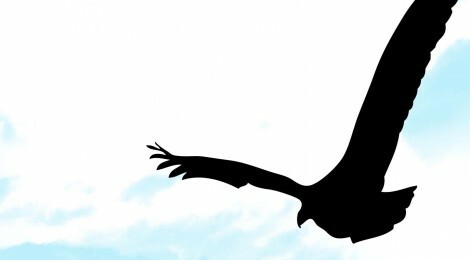 The eagle took her job rather seriously, often gliding over the valley looking out for her ideal prey for days, before swooping down with one clean motion and whisking her unsuspecting victims to their ultimate demise. The eagle could feel the pulsating animal in her mouth as she soared with it homewards. She held the package firmly enough so as to not drop it to the yawning depths below, and gently enough so as to not deface it till she presented it to her offspring. The eaglets loved the sight of a fresh meal that was warm and intact. (No child likes its goodies with fingerprints, does it?) They would peck away excitedly at the poor animal that was still alive. Often, the shock would kill it before the wounds. And she had no complaints about her condition. She enjoyed her solitude and nature’s glory all around her, what with sparkling streams of water, imperial mountains, lush meadows and silent valleys – all to behold from her room at the top of the world. It was a lot better than, say, being a human, subjected to squalor, treachery, politics and hardship. The cobbler’s life was so vacuous that polishing the filthy shoes of a stranger was the highlight of his day. Not so much for the revenue it earned him, as the fact of being gainfully employed. It was his ‘purpose’. The cobbler was unmarried and lived in a shanty slum, but prided himself on being able to glisten a dull pair of shoes with aplomb. He also had an anthropological side to him, closely examining the shoes of his clients and, with a quick glimpse of the man’s dress and demeanour, guessing his occupation, community and class. For instance, a stern-looking chap in either white or grey, striped trousers and a white shirt would invariably turn out to be a lawyer on his way to court, and a flustered, overweight chap in a light-blue, striped shirt was usually a stock-broker. The cobbler got it wrong too, at times. Once, he guessed to himself that the staid, generous client in a dark suit, who didn’t ask for his change, was a leading industrialist. As it turned out, he was the city’s biggest fraudster, a fact that the cobbler learned when he saw a photograph of him in handcuffs (with a beaming police officer) in the local newspaper a few days later! The cobbler spent his free time playing the harmonica, which gave him tremendous peace and release. It made him as equal to any other well-to-do person (if not more equal? ), he thought, and his poverty and loneliness were temporarily eclipsed when he hummed the gentle instrument. He enjoyed renditions of old movie songs and some self-composed tunes that he secretly played with a smile. The urchins that begged on the same street as his, often clapped and mock-danced to his tunes, and the neighbouring street vendors tapped their feet for a few moments of respite from the scorching sun and the harshness of their existence. The cobbler rarely conversed with the urchins or the merchants, but they were his friends and he, theirs. He also enjoyed ogling at the pretty young girls that would race to work across his street. They were at touching distance and all he would mostly get to see were their pedicured feet and waxed legs, when they were in open-strap shoes and skirts. He fell in love about fourteen times a day, and all over again the next day with fourteen new pairs of feet and legs. Food was minimal – curry and rice and onions, twice, daily – but cherished. On a good day, the cobbler could throw in a few ‘crispies’ bought from one of the adjacent shops, or may be, even a toffee. Importantly, he had an appetite and hunger is a mean sauce as Cervantes observed. The cobbler’s existence was centred on earning money every day so he could buy his food and get some sound sleep after bathing under the street tap that drew water from the guts of the earth. There were other simple pleasures like watching a film in a tent once a month or the occasional glass of country-liquor bought at the wine shop nearby. But such pleasures were infrequent and coveted. The cobbler lived in penury, but not disgrace. He reconciled to the hardships of human existence, but often consoled himself that it was far better to be an evolved human-being with feelings and emotions and friends and music and romance than, say, an animal or a bird. “That would be unbearable …” he would shudder. Both the eagle and the cobbler were summoned by the Boss the same morning. Both arrived with glowing reports. The Boss certified them as candidates who had performed jolly well. Both had found meaning and joy in their roles and had expressed themselves fully. Both had found truth. The Boss offered them a well-deserved cold drink and a shower, and a soft bed to sleep on. They slept a sleep they had never encountered before – deep, clear, calm and infinite. Perhaps the show had drained them out, or perhaps, the Boss had a way with things. Both exuded a gentle smile as they slept. The Boss smiled too as he sat down to script his next sequence – The Dolphin and the Queen. Aditya Sondhi practises law before the High Court of Karnataka and the Supreme Court of India. Aditya is the author of a book titled ‘Unfinished Symphony’ (Penguin, 2003) and an award-winning short story writer. In his free time, he enjoys reading, writing, travelling and public-speaking.